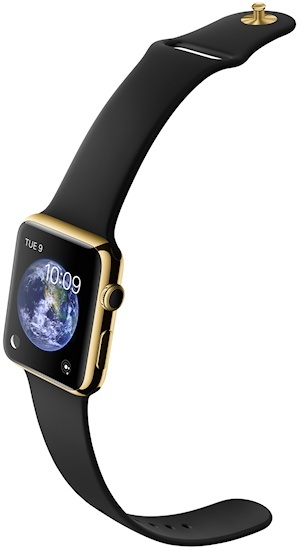 A relatively late entrant into the smartwatch market, the Apple Watch defies expectations in many ways. First of all, it's just called the "Watch" and not the "iWatch", and in fact there are three different series of watches (Watch, Watch Sport and Watch Edition) in large and small sizes with a variety of wristbands. Secondly, it's a bit mundane looking with a rectangular display and minimalist design. But the elegance is really in the design details and the sheer choice of options. Thirdly, the Watch isn't controlled in the same way as other smartwatches. Yes, it has a touchscreen that uses gestures heavily, but it also has a "digital crown" clickwheel at the side which allows finer control. Fourthly, Apple have gone away and had a really good think about the sort of things that a smartwatch should do. The Watch has a comprehensive set of fitness features, it can actually do useful things with NFC, makes a good attempt at actually making applications do useful things on the tiny screen, and it manages to make it all fun rather than a chore. As you might expect, this is not a standalone device and it needs to integrate with a compatible iPhone (5 onwards). Of course, Android users have more choice of devices, but until now Apple users had none at all. Fitness and health features include a heart-rate monitor, gyroscope and a pedometer, combined with integration into iOS 8's new Health app or any number of other apps. You can even share some data directly with other Watch users. Some novel features with the Watch include an application to find where you parked your BMW, an electronic key system for Starwood Hotels (presumably using NFC), and you can use it as a ticket for American Airlines as well. 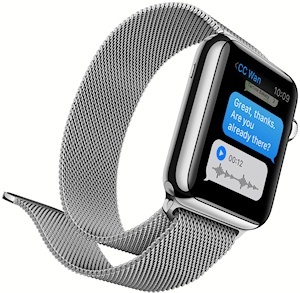 The watch faces are highly customisable, and other fun features include Emoji-type messaging. Significantly, the maps application has been redesigned from the ground up and now comes with something called "tactic feedback" which helps you know which way to turn when walking by vibrating your wrist. 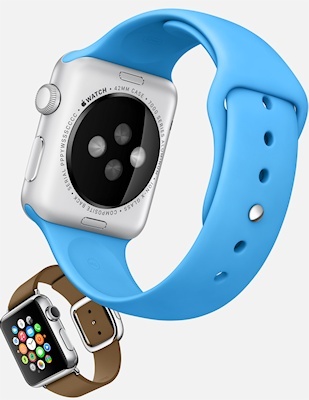 The Apple Watch has its own wireless charging system that clamps onto the back magnetically. Rival devices just use a simple dock or tray for wireless charging, it remains to be seen if Apple's approach is better. The Watch is the base model (with prices starting at $349 in the US when it goes on sale next year), the Watch Sport comes with a toughened case and a sports strap as standard, and the Watch Edition brings on the bling with some 18 karat gold. Overall, there are six different case combinations and several different straps which at the moment gives three dozen different variations to choose from. If the Watch becomes popular, then there might be more variations to come. Most of the major manufacturers (with the exception of HTC, BlackBerry and Nokia) now have reasonably advanced smartwatches. So, now it is up to consumers to determine if they actually want all this wrist-mounted technology or not. Where will we be in two years time? Will smartwatches be forgotten? Or will they be the next big thing? Watch this space.